Two friends trapped in adolescence. Their first encounter with Woman and the supernatural. Constant reassessment of values and a heroine from out of Lewis Carroll. Arrangements to meet at night at her parents' house. Reading Albert Camus and caviar-parties for four. The Dawn Spirits and the fugitive abbot. An apparition from Hell. The golden decade of the 1970s and the nymphomaniac chimera. Long live virgins! In other words, a very tender love story. 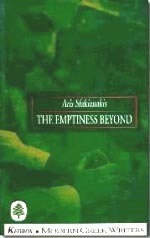 Or, The Emptiness Beyond.